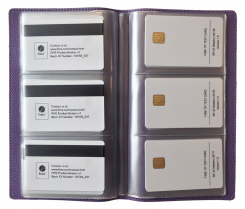 Global ExpressPay test cards are used to perform ExpressPay Terminal E2E certification. The Global ExpressPay card deck is an American Express Qualified test tool. It can be used with any type of contactless terminal, POS and ATM. The card-terminal transaction logs are simply retrieved using card log software and a PC/SC card reader. Card logs can be saved in the American Express format which can then be uploaded on the on-line American Express Test System (ATS).